This chapter instructs you how to do the DDA test and how to prevent common mistakes. Because you are now doing science, you must adopt precise habits and constantly be aware of possible mistakes. The DDA is by scientific standards a very simple test, which junior college students should be able to do successfully. Read this manual carefully and keep it with your test set for easy reference. Be aware that this chapter on Internet is updated from time to time as new developments come to hand. A short introduction to the DDA method. For a more complete introduction, please read the DDA index page which also has a dictionary of strange and new words. Although it looks unassuming, the pH meter is a technological achievement of precision that needs to be cared for and calibrated often. Your results depend on it entirely. See also the document ph.htm explaining more. Scientists have access to a large assortment of containers to be used as vials but we took vials that are readily available from your photographer: film cans. A 50m long non-stretching measuring tape as used by surveyors, enables you to measure the visibility of the water you are testing. Here are some tips and tricks. When measurements are done at a constant temperature, they can be compared whether taken by different people, at different times or places. Your travel incubator is a special instrument. Not only temperature must be standardised, but also the sequence in which measurements are done, and how many in total. How to calculate biodensity and rate of attack. How to prepare your used vials for a new test. ddatray.gif (8KB): the cutting and folding layout of an incubator tray, fits on an A4 cardboard. ddaplot.gif (11KB): a special graph paper to plot the results on. While searching to explain the degradation occurring in the sea, Dr Floor Anthoni discovered that the planktonic decomposers had been overlooked as a most important missing ecological factor (limiting factor). That enabled him to discover a method to measure not only the activity of the decomposers but also the total decomposable biomass, which could consist of plant plankton, animal plankton, bacteria and other biological material such as raw sewage and undefined dissolved organic matter (DOM). It is important to understand that the Dark Decay Assay (DDA) is not able to tell these apart. The DDA is indeed quite simple in principle: take a water sample in a bottle or jar. Shake it so that it becomes evenly mixed. Pour it through a coars sieve (strainer) into containers (vials) that can be sealed, and fill these as full as is possible. Screw or press the lids back on and store the vials in a perfectly dark place at a constant temperature. About once a day, open each container and measure its acidity (pH) using an accurate three-digit pH meter. 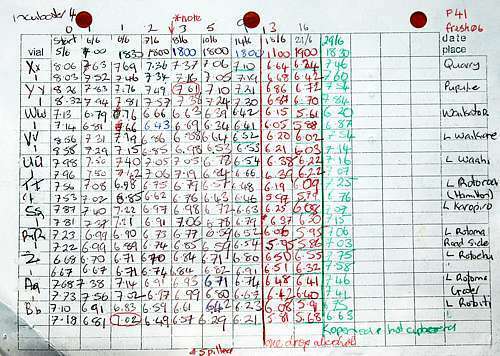 Plot the results on graph paper or on computer. After one week at elevated temperature which accelerates the decomposition, all biological matter has been decomposed. Wait another week to be sure. What happens inside the vials? Because plants cannot survive in the dark, the plant plankton immediately stops working and eventually dies, which happens surprisingly quickly, already after two days in the dark. The decomposers which consist of single-celled bacteria, fungi and viruses, will decompose the plant plankton and eventually also one another. Because they break apart the biochemicals of life which consist of carbon chains with many hydrogen bonds, hydrogen ions (H+) are returned to the water which makes the water more acidic. Because the lids are air tight, these hydrogen ions cannot escape in the form of gases, and they are measured by the pH meter. Thus the pH is an indication of the amount of biomass decomposed, and this can be plotted as curves on a graph. curves taken one day in one place can be compared with those taken on other days in other places. measurements such as the bacterial Rate of Attack can be read from the shapes of the curves. by elevating the temperature (making it warmer), decomposition happens more quickly and this saves time. two collar lids with holes for the pH probe. a 50 metre measuring tape, rust-proofed, complete with sinker to measure visibility with. 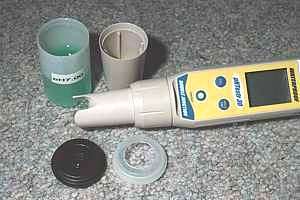 a salinity meter also capable of measuring temperature, needed when working in brackish water of estuaries. a portable battery-powered GPS for recording actual position, needed when working on large lakes or the sea where position cannot easily be determined from a topographical map or chart. Don't test in very bright surroundings like in bright daylight. Don't remove samples from the incubator until ready for testing. fill each container as full as is possible but a small bubble is unavoidable. don't waste liquid while measuring, but some is spilled when shaking the pH probe. at the very beginning, the initial pH, day zero. about 48 hours later, where the Rate of Attack is measured at day 2.
at the very end, after 1 and 2 weeks, on days 9 and 13 when total biodensity is measured. screw or press the lids back on tight and verify this. minimise the number of measurements by following the recommended time schedule. remember that after a few days when the hydrogen ions have accrued (and the pH has dropped), they are more keen to escape (due to a high partial pressure inside the liquid). group your tests for similarity as the pH meter then settles faster. Do not alternate salt and fresh water samples for instance. Note that the largest escape path of hydrogen ions (through their gases) is through the air bubble above the sample. This happens slowly, until the gases above and inside the liquid are in equilibrium (balance). When the vial is opened, the bubble escapes, and with it all the gases inside it. While doing the measurement, some gases escape from the liquid, but this goes rather slowly, because most measurements are done in 1-2 minutes (7-10 minutes for fresh water!) compared with a 24 hour or longer waiting period in between. Thus it is important to keep the air bubble small. As part of the measuring routine, it pays to shake each container a few times in order to stir its contents, but we have not been able to demonstrate that this actually matters. The photo shows the collar lid pushed around the pH probe, just before it is pressed home onto the vial for measuring. The collar has a dip that allows the liquid to rise up and outside the vial without spilling it. 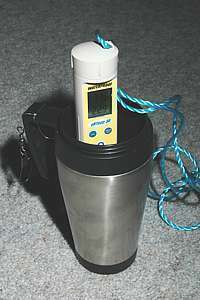 The measurement takes place in a dark beaker, in this case a thermos coffee mug which could also be used to scoop a sample from the sea (or to drink hot coffee with). Although the water looks clearer than drinking water (which it is most times) you may forget that inside lives an ecosystem containing millions of individuals of thousands of species. It is a true mini world to such an extent that each vial decomposes in a different way compared to every other vial. Thus even when samples are taken from a well mixed jar, differences between them will develop. So it is a good idea to take more than one sample from an evenly mixed jar. For non-scientific work about two samples are adequate, but for more precision and to satisfy scientific criticism, more samples are required from a jar taken at one place at a given moment in time. This of course can easily double the work later. One can often limit the number of duplicates when a batch consists of mostly similar samples taken from similar bodies of water, following a coastline for instance. Having many vials with many different microbes inside them, raises the possibility of cross-contamination. In its worst case, you will end up with each vial containing the same stuff as all the others. Thus minimising cross-contamination should also be a priority. Ideally one would like to sterilise the pH probe each time before inserting it into the next vial but this raises other problems. Fortunately for us, our samples behave more or less like fully populated communities where introduced strangers are not noticeable and cannot multiply unless there is vacant space available. Thus cross-contamination is fortunately not very serious. But there's more to it. Where we measure the Rate of Attack in the first 48 hours, cross-contamination is still so minimal that it does not play a role. The beginning of each decay curve is truly due to the decomposers already in the sample and to those that are already numerous. What happens later, is less important. But we noticed that complete decomposition is often not happening unless a small amount of cross-contamination has occurred. It seems as if all the bacterium species necessary to decompose other bacteria, must somehow be present and if not, must be introduced in very small numbers. shake the probe and collar lid thoroughly before inserting it in a sample from a different place and time. The proper shake happens from the wrist in a lashing movement while holding the pH meter by its far (dry) end. Several shakes are necessary. Make sure never to hit the probe to an object because it is a very sensitive instrument and a replacement probe is rather expensive and takes a long time to become stable. do the samples in the order of most similarity. Thus it is not a good idea to switch between estuarine and open sea samples and back again. Do all estuarine samples together. Likewise group freshwater samples together, and so on. In order to be successful, you must commit yourself to your experiment such that the measurements are done timely and accurately, a spying eye is kept on things that could possibly go wrong, and things are kept tidy. 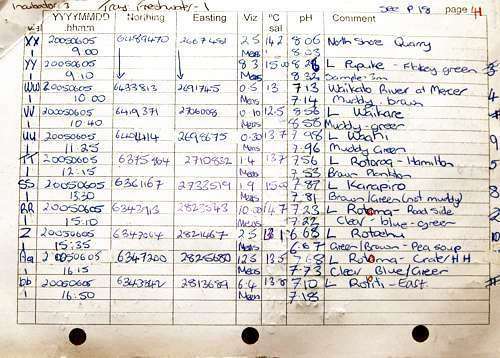 One of the most important tidiness should be the way in which you record your results. Write clearly such that there can never be doubt about the figures. In case of mistakes, use a typist's white-out method so that in the end, the data cards look tidy and anyone can clearly read and transcribe them. Remember these cards carry the results of all your work. Make it a good habit to do backups now and then by photocopying all cards that are ready. All items used have a name like A1, A2, B1 or ALPHA, BRAVO and so on. 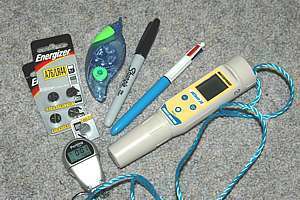 Where more than one pH meter is used, they also have unique names or numbers. All this is necessary in order to be able to identify the sets used, without confusion so that irregularities can be tracked down. For instance, a certain vial may always be out of line, possibly caused by a crack in the material. This can be tracked back because all results have been labelled. Once an experiment has completed its course, the data must be plotted to make sense. Plotting cards are provided and a four-colour ballpen. This will need some experience. Although the portable battery-operated three-digit pH meter looks unimpressive, it is nonetheless a technological achievement of high precision. Your results depend on it entirely, so it needs to be looked after and recalibrated often. A pH meter measures the voltage difference between a glass bulb with internal electrode, and an external electrode. It also has a thermometer to make automatic temperature corrections. Its output is in pH units which traditionally run from 0 to 13 with 7 in the middle. A pH of 7.00 corresponds to neutral water. A pH lower than that corresponds with acidic liquids, and above it with basic or alkaline liquids. The scale is logarithmic and upside-down, such that a liquid of pH=6 has ten times the number of free hydrogen ions than that of a pH=7. A pH=5 has hundred times more, and so on. The sea has a natural pH of 8.1 but lakes may differ considerably because they are not interconnected. For more about pH meters, read the chapter about it (ph.htm). You have been provided buffer solutions with known acidity or alkalinity: pH=4.01, 7.00 and 10.01. Chemical buffers have the property that their pH values are not easily disturbed by contamination, but we will attempt to minimise this. Your pH meter assumes that when it is presented a solution close to pH=4, and the calibration button is pressed, that the solution is exactly pH=4.01, and it will make an internal adjustment accordingly. Begin with pH=4 because it has the most hydrogen ions. Rinse the pH probe with tap water, shake it dry and present the pH=7.00 solution. Once the reading has stabilised, which can take ten minutes, press the necessary buttons to calibrate. Finally the pH=10.01 solution is done. Because our measurements range from pH=6.2 to 8.2, the middle value pH=7.00 is very important whereas the furthest away, pH=4.0 and pH=10 are least important. Thus the pH=7.00 calibration is done most often and with most accuracy. That is why you keep three vials with pH=7.00 buffers. One is labelled FIRST to take any contamination first. The other is least contaminated and most precise. Then there is also a spare just in case. You can get new pH buffers from a friendly laboratory or from a laboratory supplier. They recommend that buffers be replaced every year, as they have an expiry date. You can extend the life of buffers by storing them in a dark, cool place. When a pH meter is new, it drifts so much that it needs to be recalibrated at least twice daily. After a few days it becomes more stable and after a few months it may need calibration twice weekly. Make a note of the old pH=7 values before pressing the calibration buttons. When a pH probe is faulty, it can be replaced without replacing the body holding the electronics. Every time a probe is recalibrated, it is registered in your calibration log. This allows you to detect problems at an early stage. Scientists have access to a large assortment of containers to be used as vials but we took vials that are readily available from your photographer: HDPE (high density poly ethylene) film cans. These HDPE cans protect the sensitive photographic emulsion from dust and moisture, so they should also be air tight. Unfortunately this is not securely the case for most brands, and we tested the FUJI film canisters with transparent bodies and transparent or black lids as the best choice. Their lids push down INSIDE the container into a polished groove. Test the lid's fit for each container, by rotating it. The lids of these canisters are shaped such that a bubble can be formed right in the top of the lid, allowing the lid to be pressed close. With a cork-borer tool, a hole can be cut in a lid such that the pH probe fits securely in the hole of the collar, and then onto the vial. It fits sufficiently neatly that the container can safely be lifted with the probe. The probe needs to protrude only a little, as the liquid pushes up around it on the outside of the collar. This kind of lid allows for the smallest possible bubble in the container, as well as for the smallest amount of liquid lost to measuring. In this photo the green liquid is the calibration buffer of pH=7.00. The probe's cap is also shown but not visible is a small moist sponge deep down. Upon completion of each test, the vials are soaked and rinsed in clean tap water or sea water. Note that sea water is less effective as it is less solvent than fresh water, but it has no chlorine bleach which could affect your results. It would be preferable to sterilise the canisters with ultraviolet light, but letting them drip-dry upside down, then placed on tissue paper, drying in bright sunlight achieves enough. Remember that a small amount of contamination appears to be necessary to achieve complete decomposition. Do not use soap or other detergents, or bleach or any chemical, as this may upset the next test(s). Using other containers? We have tested many types of container, small and large and came across some inexplicable differences. For some reason the plankton ecosystem is easily inhibited by PVC containers and even glass! So don't be dishearted if you don't get any results with different containers. First work with the FUJI HDPE film can before trying others. A long measuring tape is needed for research that relates biodensity and rate of attack to underwater visibility. The idea behind it is that plant plankton must absorb light in order to photosynthesise. Thus it obscures light and is therefore visible. The more light is absorbed, the more chlorophyll is present, and there should be a close relationship. The theory behind this and practical results are explained in the chapter about the DDA method. Here we concern ourselves only with how to measure underwater visibility accurately. Note that underwater visibility has a large range, from 0.05m (5cm) in some lakes and estuaries to 50m in a blue sea. The measuring tape should thus not be shorter than 50m but for visibility ranging from 0.05 to 2m a long pole with calibration marks would be more suitable. It is also the preferred method where currents run. In the scientific literature the Secchi disc method is described and used. This is a 20cm flat disc with 2 opposite quarters painted white and two black. It is lowered in a horizontal position off the measuring tape. Where the black and white pattern disappears, the depth is read from the tape. This method has several problems. the disc sinks only slowly as it flutters downward like a falling leaf. When being pulled up, it offers high resistance and is difficult to reel in. It does not have a hydrodynamic shape. when employing the disc from a boat, one finds that the boat drifts so much that the tape does not go down in a straight line but in a curve, seriously affecting precision of measurement. the disc has a fixed size of 20cm which is right for shallow waters from 6 to 15m but it is too small for deeper deployment and too large for more shallow measurements. the measurement depends largely on surface and weather conditions. In a calm sea with a blue sky and bright sunlight, one can see the disc deepest. But on an overcast day in rough conditions the disc is quickly lost out of sight. We found that a simplified method worked just as well. Just tie a white shopping bag to the end of the tape. Cut the bottom out of the bag so that it does not catch water or air. Shorten the bag as needed by tying a knot in it for shallow deployment. By jigging the tape, the bag flashes as it flaps up and down the tape's shackle. A 0.2kg weight (a sinker) is ample to shoot the empty bag down quickly, while also making it easy to reel in. by floating in the sea, one does not drift like a boat in the wind and the sinker descends straight down. a dark dive mask removes the reflection of the water's surface so that the same accuracy is obtained in rough and calm seas, blue and overcast skies. the tape can easily be read without making adjustments for the height from the railing to the water. However, this method does not suit all conditions and people. Fortunately the graph in which visibility is plotted against biodensity, is rather coarse, with visibility plotted logarithmically. The biomass measurements also have uncertainty. All this means that visibility must be measured only reasonably accurately (to within 10%) and that any serious effort is much better than an estimate. When measuring inside estuaries where currents run, a long pole with a white object attached to its end is more suitable. See the chapter on equipment for suggestions. a mechanical thermostat has been fitted to regulate temperature. Its bulb (sensor) makes thermal contact with the metal inner box such that it reacts swiftly. As a result, the mechanism switches on and off more frequently than strictly necessary. inside the box, making contact with the element, a heat absorbing freezer pack is placed to even out temperature fluctuations. an emergency rechargeable battery of 1.3Ah has been placed inside the mechanism. This battery is inadequate for continuous operation as it would only last for 15 minutes at full power. But it protects against power failures and it keeps the incubator running while disconnected, such as for measuring and leaving the car. a precision digital thermometer with external sensor reaches down into the box, making internal temperature visible outside. inside the box two aluminium trays are placed, each holding 24 vials. the box closes tightly so that it also functions as a dark box. frequently monitor the displayed temperature because it varies somewhat when the outside temperature changes drastically. swap the trays daily such that the top tray becomes the bottom one and vice versa. make sure that the incubator is connected to an external power source because its internal battery soon runs out. when you have reached the ideal setting, tape the dial over with wide duct-tape so it cannot be altered accidentally. This is particularly important when travelling in cars and boats. Note that any irregularity in temperature may void your whole experiment! the DDA measures the accumulation of hydrogen ions which are easily leaked away, affecting the accuracy of the method. However, the most important use of the DDA is in comparative studies where one time and place is compared with another. So even if not 100% ideal, its most important aim can be met by standardising how it is done. to minimise ion escape, the number of measurements is minimised, and this minimises also the amount of work. in the beginning, the sample still behaves very much as if it were in situ (in its natural place) but as hydrogen ions accrue and oxygen is used up, it becomes rather artificial and its main purpose is now to decompose all biomatter completely, including the bacteria themselves. The very first four measurements must therefore be done accurately. Note that the pressure for ions to escape is then still minimal. On day 1 two measurements are done, as if the first three were spaced 12 hours apart. This is needed to capture the powerplankton which shows a flat shoulder followed by a steep decline after 36 hours. On days 3 - 5 the measurements need little accuracy as they change rapidly. One would say that measurement is not required, but the DDA has shown to proceed better, perhaps due to a small amount of contamination needed. After the measurement on day 5, three drops of 20% alcohol (one drop per 10ml) are added to the second set, in order to provide the bacteria with the missing energy lost to biochemical conversions. Note that the added alcohol does not speed up the decay but helps it across a threshold. The temperature was chosen such that the whole experiment finishes on day 9 when an accurate measurement is done. Day 13 is just there to check. Sometimes the pH begins to increase, a sign that hydrogen ions are being lost. The experiment finishes just in time before the next one in a fortnightly cycle. Because the addition of alcohol measures a different property of the plankton, a separate set can be assigned but it does not require extensive measuring. (*) alcohol affects natural pH readings. Use for comparison only. Please note that improvements to the DDA technique are made from time to time and that this time schedule may change accordingly. Check this page from time to time. The DDA method has introduced the hion as a new unit for biodensity to facilitate comparisons. During decomposition, hydrogen ions are freed and many of these become hydrogen ions in solution, which are measured with a pH meter. The DDA method is based on the assumption that these hydrogen ions are a proxy for biomass although how the two relate EXACTLY, has not been ascertained. This chapter shows you how to calculate hion biodensity from the differences in pH. The hion as unit of biodensity assumes that for most practical situations, the pH does not rise above 9.0, and if it does, the number of hions involved are so small (less than one) that they can be neglected, but fractions of a hion are still technically possible, even if they are not measurable with a three-digit pH meter. Min store into memory. Some calculators use STO ore something. Before using the vials for testing, and after completion of each test, vials must be washed and dried. It is really very simple. Ideally one would want to sterilise them but this is not easily done without introducing new problems. Remember that each sample will contain a living ecosystem with thousands of species and millions of individuals. Remember also that the plankton ecosystem is easily inhibited by chemicals such as fluoride and chlorine from tap water and various kinds of soap. If you are able to collect rain water from your roof, this is a real asset. If you have access to distilled water, it comes in handy. But you can achieve satisfactory results by simply rinsing the vials in warm tap water. Don't get tempted to use soap but wash your hands with soap first because a smudge of skin grease on the inside of a vial can upset measurements. The rule for washing or rinsing is successive dilution. If your first wash is effective only by 90%, leaving 10% 'dirt', the next wash will leave 10% of 10% or 1%, and the next one after that 0.1% 'dirt'. So the secret is to wash at least twice. The third wash can be done with distilled water but this is not strictly necessary. 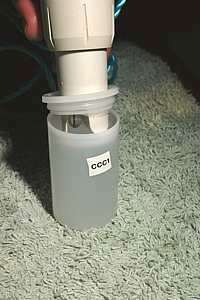 It is more important to dry the containers completely such that pollutants like chlorine and fluoride evaporate. Shake the moisture off and place containers on a towel in the sunlight before a window. This provides enough ultraviolet light to reach the cleanliness desired for the next test. Once the containers and their caps are dry, cap them and store them away in the dark. However, the dipenser needs to seal perfectly for the solution to last. Even so, discard it when there is less than 20% left in the dispenser. From the local chemist you can purchase 90% pure ethyl alcohol (normal alcohol) which needs to be diluted 4.5 times for 20% final strength. You can do this with either a sight glass or with scales. You won't need more than 50ml of it. Fill the sight glass to 10ml with 90% alchohol, then add distilled water to 45ml (35ml added). With nearly 30 drops per ml, this suffices for 1350 drops or at most 450 samples. Make a new solution when less than 20% or 10ml remain in the dispenser.